AUSTIN, Texas (May 7, 2017) – Lone Star Racing and the team’s second-year driving duo of Dan Knox and Mike Skeen persevered through a challenging but promising debut this weekend of the team’s new No. 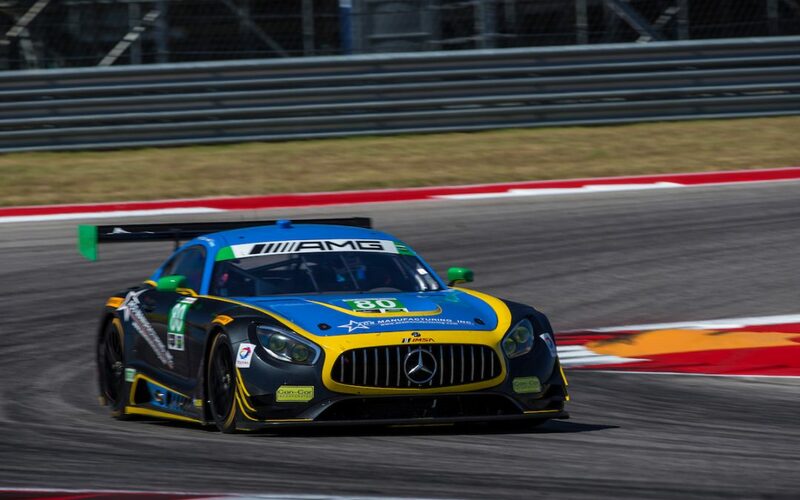 80 ACS Manufacturing Mercedes-AMG GT3 at Circuit of the Americas (COTA), earning a 12th-place finish in Saturday’s IMSA WeatherTech SportsCar Championship race at COTA. Both its first race of 2017 and first race with its new Mercedes-AMG GT3, Lone Star was among the quickest cars in the GT Daytona (GTD) class in Thursday practice, but the team later dealt with some challenges as the weekend went on. The No. 80 sustained substantial rear bodywork and diffuser damage in a needless bump-and-run hit by a Prototype competitor in Friday’s practice, robbing the team of valuable setup time while they made repairs. Changing track conditions also added to the hurdles as race day was by far the hottest temperatures seen all weekend. Knox, Skeen and Lone Star handled it all head-on, however, and rallied for the lead-lap, 12th place race finish on Saturday after starting last in the GTD field following a post-qualifying tire change. Skeen drove just under the final two hours of the race but could never quite get the needed long-run pace out the No. 80. The COTA race was the first for Lone Star since last October at Laguna Seca. Skeen’s in-race battles kept him in some good company, but Lone Star proved in Thursday practice it is more that capable of running with the other Mercedes-AMG GT3 entries, which finished first and third in the race. Next up for Lone Star Racing in its four-race IMSA GTD schedule is the WeatherTech SportsCar Championship weekend at Road America, in Elkhart Lake, Wisconsin, August 3 – 6. – In addition to this weekend’s 2017 debut at COTA, Lone Star also selected the three-race stretch of IMSA events at Road America, VIRginia International Raceway, August 25 – 27, and Laguna Seca, September 22 – 24, for its planned 2017 program. The four-race schedule includes the same four races that the team chose last year for its IMSA GTD racing schedule.